You’ve seeded your lawn with Perfect Green and that beautiful green grass has sprouted. Taking a trip outside you walk around the premises, enjoying the smell of fresh grass as the sun rises, turning morning dew into steam. Suddenly you see a round puffy dirt mound shaped like a miniature volcano. Walking along you see what looks like a raised tube beneath the earth, and stamp your foot in frustration. Moles can disrupt fresh sod in Olympia, WA, but there are some ways to handle them. Though you may have the desire to show them whats what, and keep your grass flat and serene, sometimes it’s easier to live with them. When it comes to holes, it’s easiest to fill them back in, flatten them, and recover them with fresh grass seed. Problems will usually occur in the same area, and any plants that have been partially dug up can be re-positioned and potted back in the soil. Surface ridges can be flattened with your foot and depressions can be filled in with sand and reseeded. 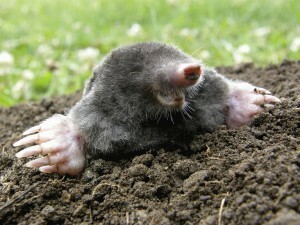 Scaring Moles – Devices intended to frighten moles are not effective. Due to their subterranean nature, moles encounter noise from footfalls, sprinkler systems, and any other number of surface objects. Regardless of what manufacturers tell you, unless it comes with a guarantee, use of sonic or vibration devices should be taken with a grain of salt. Reducing Food – Though it may be possible to reduce a mole population by destroying all soil animals with pesticides, it can have major adverse effects. Ground water can be poisoned, other wildlife can be poisoned, and invertebrates that are beneficial to your soil will be killed as well. Moles also sometimes enter well watered lawns without a food source simply for moisture, so it is no guarantee of continued mole reduction. Poisoning – Options range from gassing to poisoned baits, but all have been proven ineffective. Since their diet is primarily wild worms and insects, and their tunneling systems are extensive, neither method eliminates the problem. Barriers – These are very costly, but in extreme situations they can come in handy. Unless you have the time and resources to commit to burying mesh 30 inches deep around your whole lawn, consider learning to live with moles or another alternative. Natural Predators – Though it won’t eliminate your mole problem entirely, natural predators can go a long way towards reducing mole populations. Dogs, coyotes, and snakes all kill moles. If you can attract birds of prey like barn owls, you will have befriended a fierce predator that feeds primarily on young moles. Flooding – This is best done with five gallon buckets of water strategically positioned around the tunnel system. When done all at once it can prove effective in drowning the moles. It has a greater chance of success with new moles and smaller cave systems. It should not be performed with hoses or near structural foundations of any kind. Now that you know what you are up against, you can make an informed decision regarding moles and your lawn. For more information on lawn maintenance and the fastest growing seed to combat mole holes, contact your local dealer for fresh sod in Olympia, WA.